With more than 1,300 stores including 200 international dining outlets, you will not find a better place to shop, dine, experience world-class entertainment and take advantage of amazing promotions during the Dubai Shopping Festival than the Dubai Mall. Discover some of the best street theatre performaces in the world at the ‘Street Fest’, explore Charlotte Tilbury’s™ Pillow Talk Beauty Wonderland, avail of exclusive deals, giveaways and in-store events from panel talks to styling sessions during the “Shop the Night Away” on 16 January, and get the chance to win 100,00 Skywards Miles every week with a purchase of AED 300 or more. City Walk celebrates Dubai Shopping Festival with exciting family-friendly activities! Kids can explore their creative side and try out some freestyle painting at the Visual Art Zone, opt to sing, pick up some dance moves, play the drums at the Music Zone, or uncover the wonders of new technology at the Kids’ Projection Zone, all for free. Also be sure to visit Street Fest at Citywalk Boulevard, the two-day Street Culture event on 25 and 26 January which will showcase top street culture names across art, food, music, sports, and style, and is free and open to the public. Market Outside The Box (OTB) – a highlight of the Dubai Shopping Festival – returns to Burj Park in Downtown Dubai showcasing the best from emerging local and international designers beyond the traditional walls of a shopping mall. The event also features a range of exciting dining options and a host of activities that range from on-stage musical performances and DJ sets to guided yoga classes. A full programme of fun is planned for kids too. Spend AED 200 or more at The Beach for a chance to win 1 million worth of Meraas Gift Cards. The Beach is giving you the chance to double your chances of winning on firework nights. Besides, at The Beach you can enjoy marching roaming entertainment and fireworks with the whole family. Marching roaming performers will interact and play games with you and your little ones. The roaming entertainment will include super drummers, dabke dancers, LED show and white world parade. Fireworks Dates and Timings: 3, 4, 10, 11, 17, 18, 24, 25, 31 January; 1, 2 February at 8:00pm every Thursday and Friday. Head over to The Outlet Village this DSF to enjoy bargains on already discounted high-end brands at over 90 stores offering value-for-money deals on childrenswear, accessories, and everything in between. Shoppers can also attend professional styling sessions and participate in exciting roaming competitions, while kids can explore their creative skills in crafting the most interesting fashion accessories at dedicated workshops. 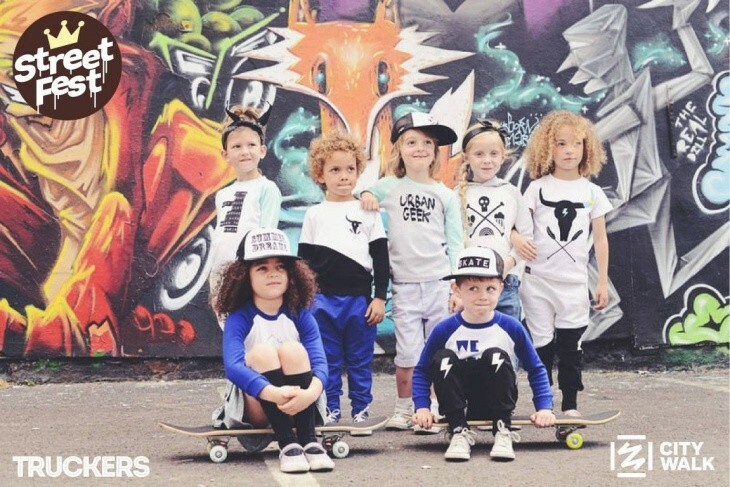 Kids Workshops are taking place from 3pm to 7pm on Thursdays and from 4pm to 8pm on Fridays and Saturdays. You can also maximise your style with the help of a renowned fashion consultant during the interactive activity ‘Fashion Comes Alive’. In addition, for every spend of AED200 and above, you can participate in weekly raffle draws, where 200 winners stand to win up to AED1 million in Meraas Gift Cards over a six-week period. 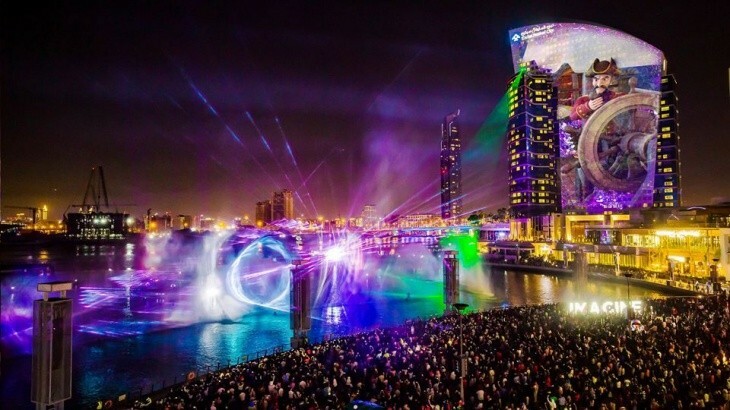 Dubai Festival City Mall has once again collaborated with Dubai Tourism to take the celebrations to the next level. By spending AED 300 or more during DSF, you get the chance to enter the draw and win one of the four all new Lexus UX Premier 200’s. What's more, Dubai Festival City Mall is launching the new IMAGINE show 'The Pirates' which will come to life at Festival Bay on 17 January and will be shown till April. 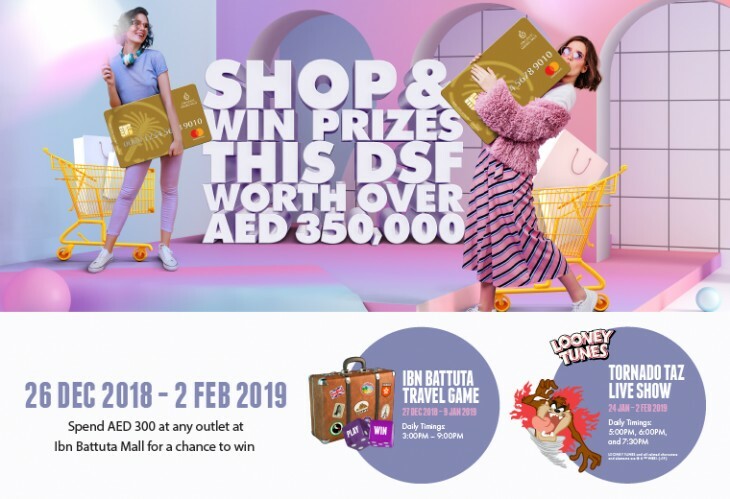 Ibn battuta Mall is bringing the DSF to visitors with an amazing showcase of entertainment and live performances including the popular Looney Tunes’ Tornado Taz, roaming parades and great prizes. Shoppers can win exciting prizes worth over AED350,000 in total in the form of the recently-launched Nakheel Malls Gift Card when they spend AED300 at any outlet at the mall. Furthermpre, everyone’s favourite Looney Tunes character is back from 24 January to 2 February on a special stage at China Court with sound and lighting effects so children can watch him travel around the world. 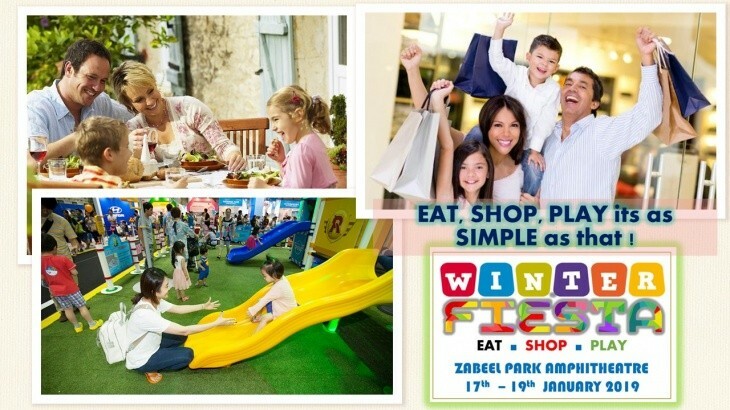 Winter Fiesta is all about celebrating family togetherness and urban living in Dubai. Indulge yourself in a whole range of activities from carnival games, face painting, inflatables, al fresco market, food variety & refreshments. Shop with the most renowned Brands in Clothing, Footwear, Eye-wear, Perfumes, Bags, Health & Fitness, Wellness. Recharge yourself with the EATERY ZONE where you will find a diverse culinary experiences catering to all tastes. Be ready to be Surprised by Stilt walkers, Jugglers, Balloon Benders, Bubble Shows, Magic Shows. And the young ones can enjoy inflatables, Jumping Castles, Bungee Jumps, soft play are and more. 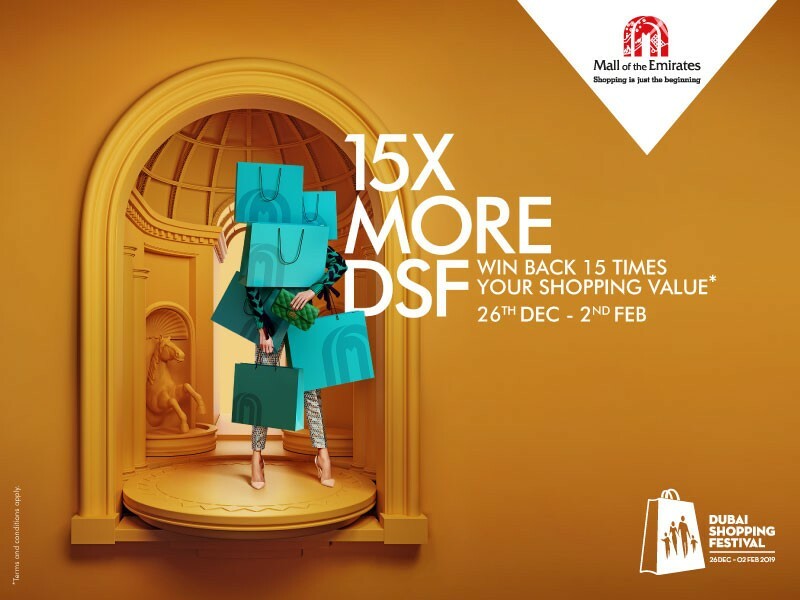 Mall of the Emirates offers the chance to win 15 times your shopping value every day by shopping for AED 650 or more. In addition, you can avail 25-75% discounts on brands in mall of the Emirates stores, including Mothercare, Carter's, OshKosh, Next, Mango and others. Twist and shout with performers from all over the world. Send your kids on an adventure with Masha and The Bear Live Show. Experience the thrill of Transformers Devastation as PlayStation gaming stations. Discover the ultimate DSF experience with ‘Shop The Night Away’ coupled with exclusive F&B offers. Take advantage of the convenient Hands Free Shopping service. This DSF, take an unforgettable journey with BurJuman. Experience the best of UAE, India, Philippines, Italy and Egypt’s pavilions with free “Around the World at BurJuman” themed installations, games and activities.